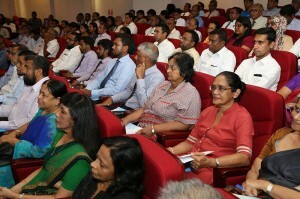 “The need for a “Tax Ombudsman” is now more urgent than ever before due to the changes in the income tax regime and the implementation of the Revenue Administration Management Information System (RAMIS), to prevent see tax payers running pillar to post,” he told an audience comprising of chartered accountants representing the public and private sectors. Dr. Kanag-Isvaran recalled how the concept of “Tax Ombudsman” was introduced in the Budget of November 2004 by the then Minister of Finance and the office was established on 15th September 2005 with the appointment of a retired High Court Judge who was the first and only holder of the office. “The administrative framework and operational guidelines pertaining to the Tax Ombudsman mandated the appointment to be a period of 2 years. No successor was appointed pursuant to the completion of his tenure. Hence that office remains in abeyance,” he said. Highlighting the benefits of tax Ombudsmen, he disclosed how in Pakistan, Federal Tax Ombudsman Ordinance of 2000 governs the institution and appointment of the Tax Ombudsman under the hand of the President. “Within 60 days of lodgment of a complaint, the Ombudsman is obliged to communicate his findings & recommendations to the Revenue Division, who in turn is required to report on remedial action taken within the time stipulated,” he said. Dr. Kanag-Isvaran said that the South African Tax Ombudsman has been constituted by the Tax Administration Act of 2011 while the tax ombudsman office was set up in 2013. The Tax Ombudsman is appointed by the Minister of Finance and is accountable to the Minister of Finance. The key responsibilities of the South African Tax Ombudsman Office has been identified as ‘to maintain a balance between Revenue Authorities’ powers and duties, on the one hand, and taxpayer rights and obligations on the other. Achieving this balance will enhance the degree of equity and fairness in tax administration and improve taxpayers’ perception of the country’s tax system as being fair and equitable. International experience shows that taxpayers are then more inclined to fully and voluntarily comply with their tax obligations’. The Canadian Tax Ombudsman appointed by the Governor in Council with a three year tenure. Canadian Tax Ombudsman’s mandate is to assist, advise and inform about any matter relating to services provided to a tax payer by the tax office, while the Indian Tax System consists of Income Tax Ombudsman and many Indirect Tax Ombudsman. “We should not be wanting the phenomenon of the Parisian ‘yellow vests’ with our proposed ‘carbon tax’,” Dr. Kanag-Isvaran noted. In conclusion, he said the taxpayers know the Government may be able to tax them, but they also need to know the use of such taxes. “Accountability is mandatory. Reasons for and uses of collected taxes should be made available to the public and this in turn brings accountability. Hence one cannot deny that “Representation” is one of the most significant right of the tax payer,” he added.